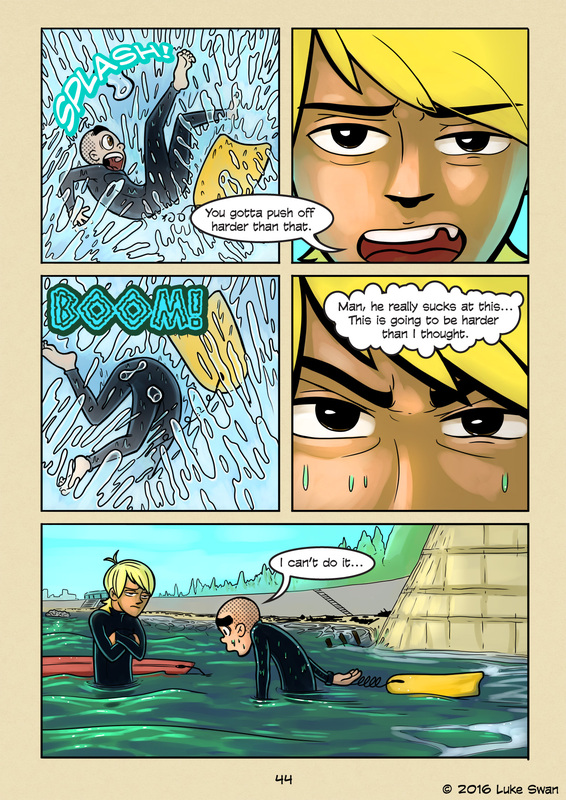 Blowing the Takeoff (#044) | Web comic "Surfer Joe"
Making the takeoff seen as the most elementary part of surfing by the more experienced guys in the lineup. That is why if you blow the takeoff on a good wave you might get some hate. But getting a good takeoff is one of the hardest things to do in surfing, particularly on a short board. If you make it and get to your feet you might save humiliation but it doesn’t mean you’ll have a good line on the wave. I’ve had a lot of waves where I just straightened out… it really isn’t much better than blowing it, just saves you some pain. The point is takeoffs are hard, and we can afford to be more patient with our fellow surfers for eating it from time to time. It’s funny people get worked up about this. There is, after all, an endless supply of waves. If not that day, then soon. As long as there are storms in the ocean. Takeoffs get easier on long boards. They have a lot of float, and their long planing surface increases glide and paddle speed on the water. This gives them the edge on getting into the wave early, and giving you time to get to your feet and find your bearings.